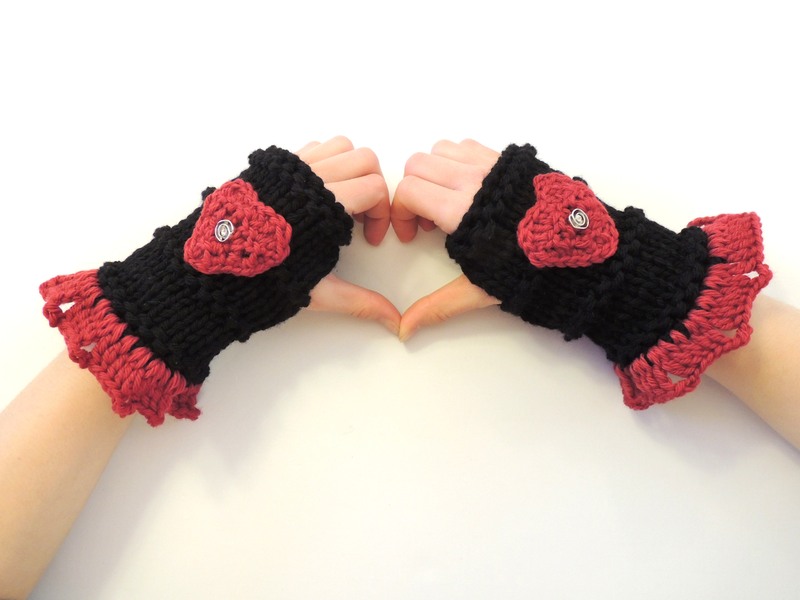 Treasured Hearts…Valentines Scarf and Fingerless Gloves set. The other day I was thinking about designing something for each holiday of the year, just for fun. Valentines being the next one in line I went to my yarn stash and started looking over the many different colours I could choose for this Holiday of Love. After deciding to go with a classic colour way of black and red I grabbed my knitting needles and began a special Valentines Scarf and Hand Warmer set. 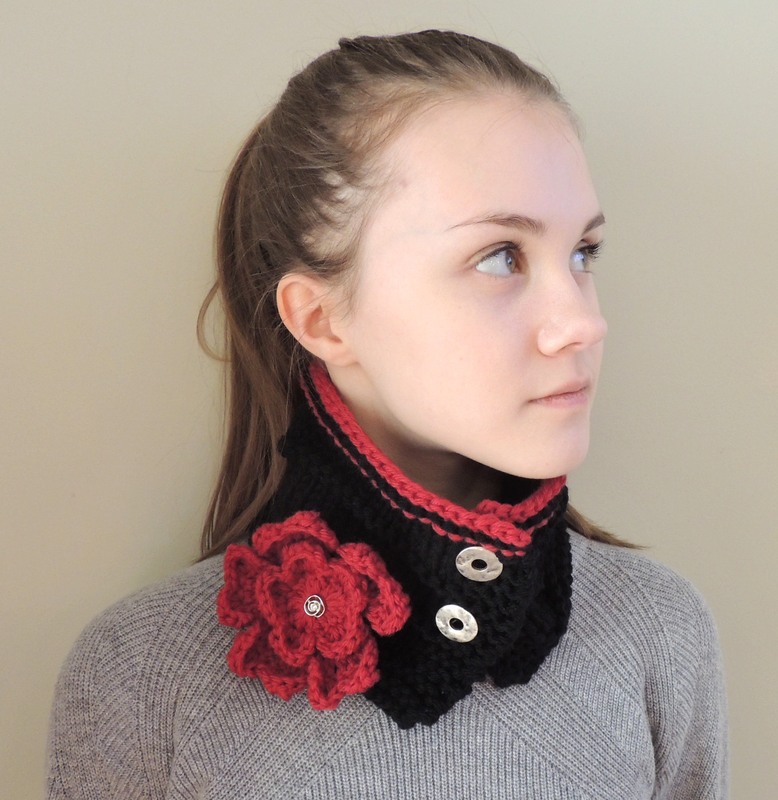 This design has a more contemporary feel to the overall piece with the accent “flower” in a broche style so you can wear this scarf with or without the broche. In keeping with the Valentines theme the Floral Hearts broche is made with 5 hearts together to form the back petals of the flower. This way the hearts for Valentines are incorporated, but the design can be worn anytime of the year since they form a flower. The Floral Hearts scarf becomes a versatile and multi use scarf, but has an underlying surprise with hearts for the petals. 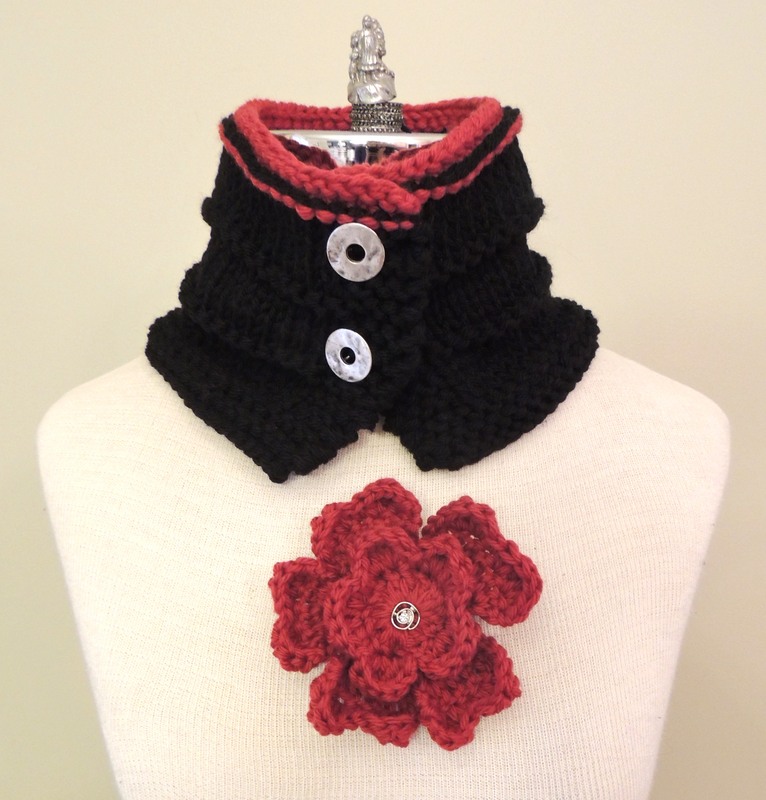 I couldn’t design a new Valentines Holiday scarf without adding something to compliment the piece. 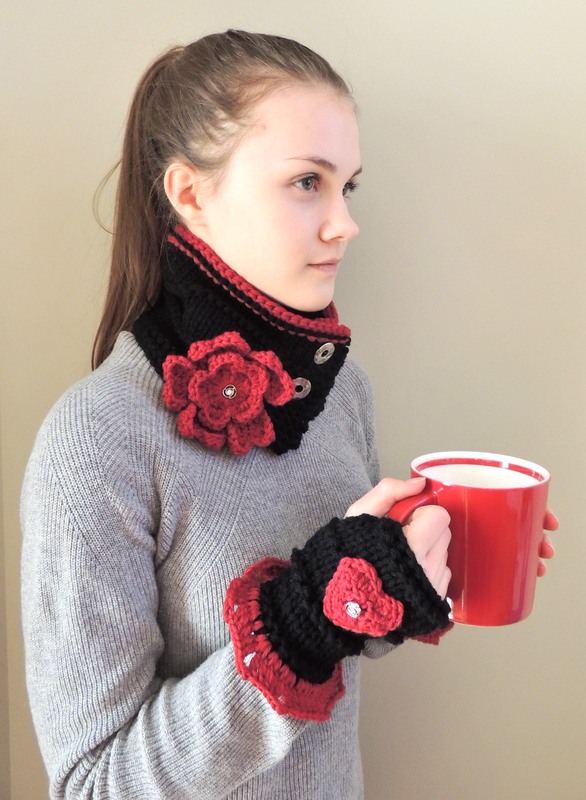 The Treasured Hearts hand warmers use the same heart I designed for the Floral Heart broche. A bling button adorns the centre of the heart. The Valentines theme on the hand warmers are more obvious. Off I go to finish a set of these two new pieces in my designs in a nice dark grey with the red. They will both be posted on my Etsy store at www.intricateknits.etsy.com . The Valentines Flora Hearts scarf and Treasured Hearts hand warmers are also available in other colours. Valentines fever is not over, I am currently working on a large window display with a Valentines theme for the Art Gallery of St. Albert. Pop by soon to see my progress on this project. Have a most wonderful day! Gorgeous! Love the colours. Can’t wait to see more, and when I can drive again I’ll go see your window display. Thanks very much!! 🙂 I will let you know when the display is up. How is your crochet going?